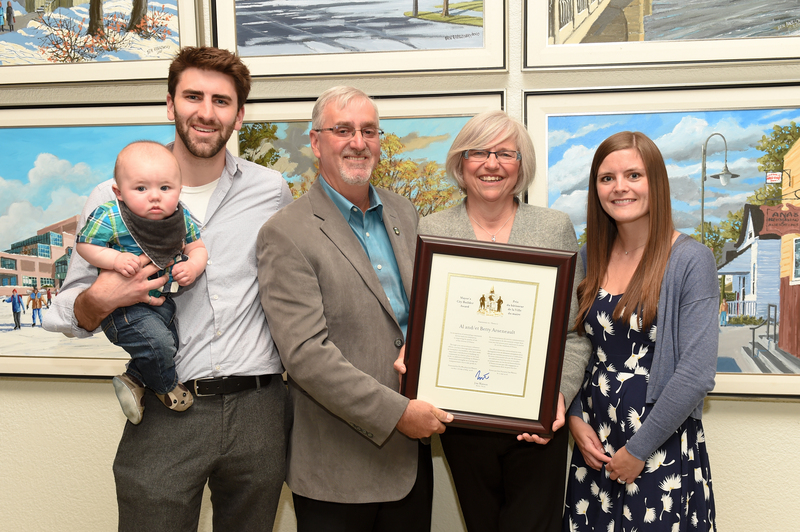 Mayor Jim Watson and Bay Ward Councillor Mark Taylor presented the Mayor’s City Builder Award to Al and Betty Arseneault at today’s City Council meeting. The Arseneaults are longtime residents of Crystal Beach-Lakeview. Their love of outdoor sports – hockey, skating and curling in particular – fondness for their neighbourhood, and enthusiasm for building community come together in their commitment as volunteers, working with the City’s Seasonal Recreation branch, to construct, create and maintain an outdoor arena and separate three-sheet curling rink in Lakeview Park each winter. Al is well known as the first volunteer rink operator in the city to get his boards in place, the first to coax skate-worthy ice out of an early cold snap, the most meticulous at maintaining the ice (it’s near NHL quality), and very quick to clear any snowfall. This means the retired public servant has to make himself available 24/7 during the outdoor skating season to flood and groom the ice, sometimes trucking loads of Zamboni ice shavings from nearly indoor arenas to fill in spots after a melt. Al also helps the Seasonal Recreation staff to train and coach new rink volunteers each fall at the start of the winter season. The curling rink has three full-size sheets with all the correct markings, and the Arseneaults host an annual Lakeview Outdoor Bonspiel that is always fully booked with enthusiastic curlers from all over the Ottawa Valley. Local indoor curling clubs lend the rocks for curling events. Thanks to Al and Betty, Crystal Beach-Lakeview and area residents, from young kids wobbling on their first pair of skates to seniors enjoying a game of shinny, are fortunate enough to have free high-quality winter recreation opportunities at their local park.